A hilarious look at parent overshare. No unbelievable pictures to weep about. 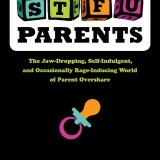 STFU Parents: The Jaw-Dropping, Self-Indulgent, and Occasionally Rage-Inducing World of Parent Pvershare is laugh out loud funny. Whether you’re a parent yourself, or a hapless victim of your new parent friends, you will definitely relate to stories and commentary on these pages. It’s a quick and easy read, and it’s a whole lot of fun. We all know them – those social media friends who feel they must share the minutiae of every day with every single person on their friends list. From a snapshot of their breakfast to their “ok, off to bed” post at night, every single detail must be accounted to their adoring (?) public. For some reason, when people become parents, even your normal friends start to suffer from this overshare. And – whether you’re a parent or not – sometimes the day to day happenings of life with children really aren’t meant to be shown on a newsfeed. If you’re not a parent, being thrown a picture of a full potty out of nowhere is enough to ensure you’ve made the right decision in not procreating. Author Blair Koenig took the shock of watching her news feed change from snapshots of margaritas to snapshots of birthing pools and turned it into a successful website that pairs images of grievous overshare with biting commentary. For parents and non-parents alike, it’s a hilarious outlet for discussing just how much is too much. After several years of online success, STFU, Parents is finally a book. 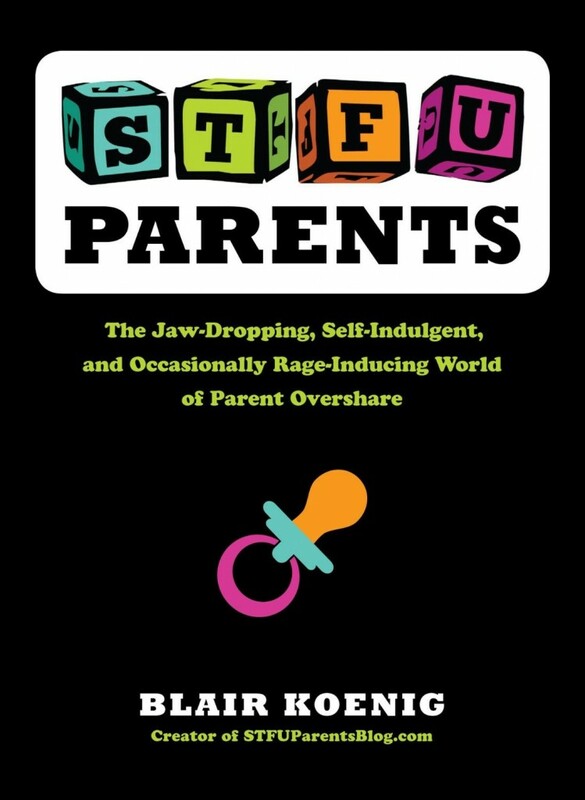 It’s a perfect fit for readers looking for some comic relief, your funny mom friends, or that new parent who needs a subtle nudge away from the course all those delivery pictures seem to be taking. For regular readers of the website, you’ll be both happy and a little disappointed to see the book contains no pictures. Happy because, well, when we’re talking about overshare, bodily waste seems to inevitably make its way into the picture (pun intended). At the same time, it’s disappointing because part of the fun of the website is seeing for your own eyes how very far some parents have gone over the edge. You think to yourself, “There’s no way someone would actually post *that*”, and then cry for humanity when you see that, in fact, they did. Pictures aside, the book follows the same format as the website, grouping different types of overshare into categories for your enjoyment. From getting a little assistance with personal grooming during pregnancy to teenage shower habits, there is seemingly nothing that people won’t share with that guy they kinda know from high school. All of the favorite categories from the website make the book, from Sanctimommies to Mommyjacking to Woe is Mom, all featuring actual Facebook posts that people really put on the internet thinking, “Oh, yeah, my friends have got to hear this.” As they say, it’s funny cause it’s true – and I guarantee you’ll find posts that remind you of someone you know. In today’s world, social media is an outlet for absolutely anyone to share absolutely anything, and if we’re honest, we know that parents are definitely not the only ones guilty of a whole lot of TMI. But the simple fact is, parenting is a messy job and there are a whole lot of parts of it that should never, ever see the internet. If you just had a baby, we all know there’s poop involved – there’s no need for photographic evidence. Really. As a parent myself, I can tell you wholeheartedly that I go online to get away from my kids’s messes and mayhem – the last thing I want to see when I sit down with a nice cup of coffee and my newsfeed is a picture (verbal or otherwise) of what it looks like when a ten month old explodes from both sides. It’s just too much.